We were fortunate that Pete Lieber was available and stepped in as Interim Executive Director and did good work. We are lucky we have a good team on the committee who took their charge very seriously to move the community and county ahead. It was a unanimous decision to hire Chelsey,” said Jeff Quyle, Chairman of the MCEDC Board of Directors. “She has experience in regional economic development from a private and public perspective. 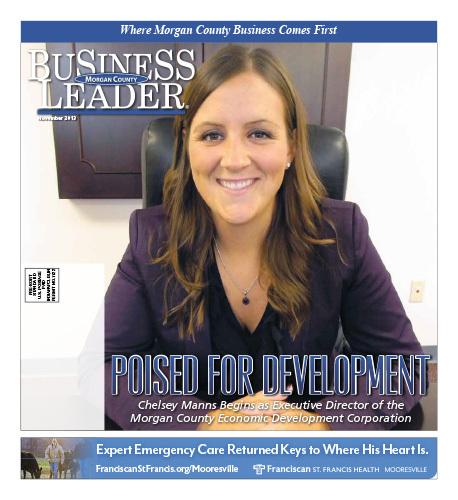 She also has a winning personality, makes a good impression and is a good listener.” Quyle says that Manns has an understanding of who Morgan County is and what its place is in the regional community and he feels that is a distinct benefit to having her join the MCEDC. Download the full November 2013 Edition here.